Kauaʻi flood response. Photo courtesy of KEMA Emergency Operations Center partners. 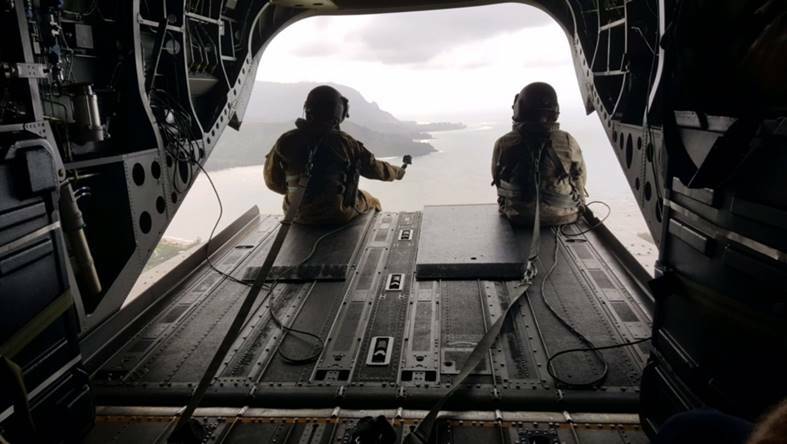 More than 220 people have been airlifted from the Hā‘ena and Wainiha areas before multi-agency relief efforts ceased overnight on Monday. Efforts will commence again this morning for stranded residents and visitors. Kauaʻi Mayor Bernard Carvalho said its still too early to estimate the extend of storm damage and costs incurred following the severe weather over the weekend. 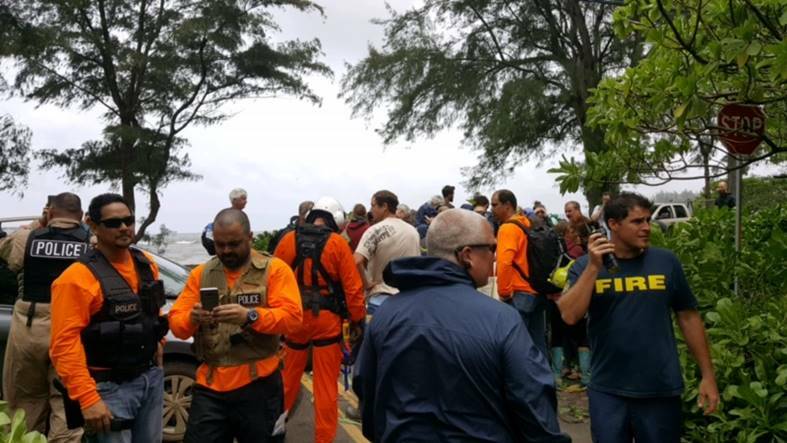 Officials say dozens of home and businesses in the North Shore area and other parts of the island were damaged, but the focus now is on relief and search and rescue efforts. Those who need to be evacuated can go to the Wainiha landing zone located just east of Ala Mihi Road between approximately 8 a.m. and 4 p.m. today, weather permitting. Those who wish to be evacuated are advised that it is unknown at this time when they can return home, as landslides continue to block access along Kūhiō Highway between Waikoko and Wainiha. For those remaining in Wainiha and Hā‘ena, water and food supplies can be picked up at Camp Naue and at the Hanalei Colony Resort. Kūhiō Highway at the Wailua River Bridge, between Kuamo‘o Road and Leho drive will have a lane closure to clear debris through 5 a.m. Tuesday. One lane of traffic in each direction will be maintained. Kūhiō Highway near the Hanalei Bridge is open to the public as repairs to the bridge were completed on Monday morning. Upon reopening the highway, the Kaua‘i Bus worked with the American Red Cross to shuttle 121 people from the Hanalei Shelter back to Princeville. With the reopening of the highway, the shelters at Hanalei Elementary School and the Church of the Pacific are now closed. For people leaving the area between Kīlauea and Hanalei, the Kaua‘i Bus is allowing free service and will also allow luggage on board. The carry-on policy will be waived for those leaving the disaster area. 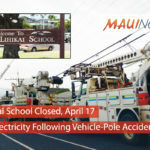 The Department of Education has announced that due to the need to address roof repairs, flooding issues, and safety concerns, Hanalei Elementary School will continue to be closed on Tuesday, April 17, to allow for repair and clean-up of the school facilities. School will resume on Wednesday, April 18. The Department of Water (DOW) has issued a “do not drink” advisory for customers located along a portion of Weke Road, from Pilikoa Street to the Makai-end of Weke road towards Black Pot Beach in Hanalei. DOW crews have repaired a portion of a damaged main line to restore water to the affected area; however, due to the exposure to the service lines from recent damage, residents along the described portion of Weke Road in Hanalei are advised not to drink or cook with tap water, as a precautionary measure, until further notice. 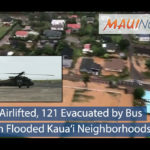 DOW urges residents to please share this information with other residents and guests that reside in the affected portion of Weke Road in Hanalei. The Department of Water reports that power has been restored to its Wainiha pump stations which will allow water services to be slowly restored to customers in the Wainiha and Hā‘ena area. However, DOW has issued a “do not drink” advisory and a conservation notice for Wainiha and Hā‘ena customers. Those who are receiving water are also urged to heed the conservation notice. KIUC crews were also successful in restoring power to most members in Hanalei on Monday. KIUC will continue to restore power on the north shore, as KIUC is able to access and repair its infrastructure. The water conservation notice from Princeville Utilities Co., Inc. continues for all its customers in Princeville, Anini Vista, Kalihiwai Bay Estates, Kapaka Road and Hanalei Plantation Road. Please be advised that as the pipe empties, it is possible that some air or sediment may enter your home plumbing. When turning on faucets after water service is restored, the public is advised to allow water to run until it is clear to ensure flushing of any air or sediment from plumbing. State Department of Transportation worked throughout Monday to clear landslides along Kūhiō Highway, while the Kaua‘i Utility Cooperative and Hawaiian Tel crew simultaneously work on repairs to fallen utility poles. The evacuation order for low-lying areas of Kalihiwai Valley has been lifted as of Sunday morning. On Saturday afternoon, the Kalihiwai Reservoir was nearing capacity and residents in the low-lying areas were directed to evacuate as a safety precaution. Since that time, the dam has been inspected and it has been deemed safe for residents to return. Officials will continue to monitor the reservoir. · Hanalei Plantation Road in Princeville remains closed due to a sinkhole. For updates on road conditions and closures, please call (808) 241-1725. Please do not call Kaua‘i police 9-1-1 unless you have an emergency. All residents and visitors on Kaua‘i are advised to stay out of flood waters and limit exposure. 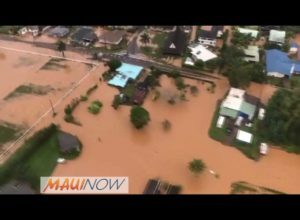 Heavy rains have caused storm water runoff throughout Kaua‘i, leading to widespread flooding producing large areas of standing water. Coastal waters have also been affected and a brown water advisory remains in effect until further notice. 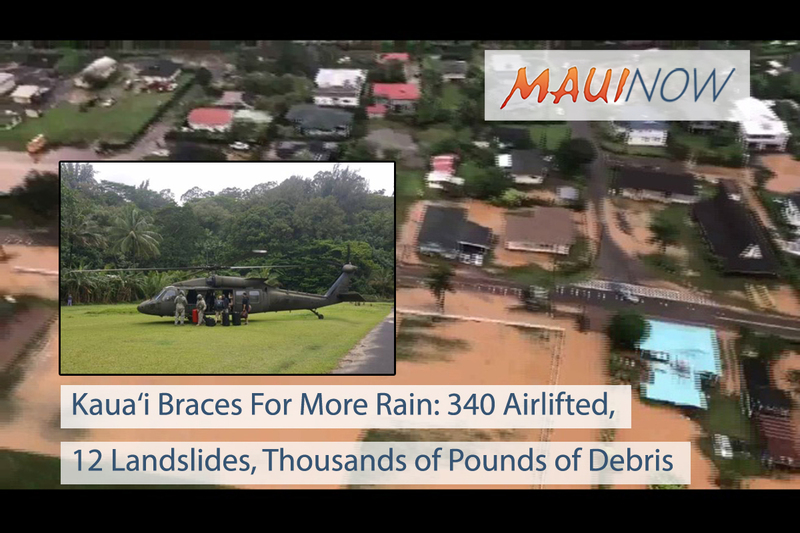 Flight restrictions implemented on Kauaʻi, particularly for drones over flood damaged areas. 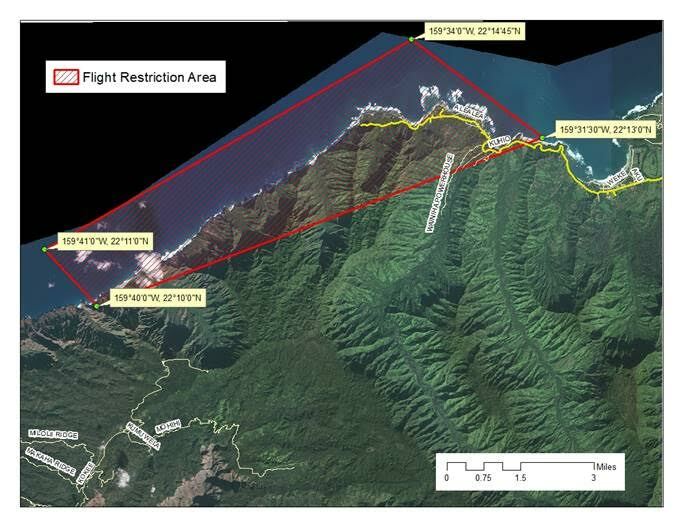 The Federal Aviation Agency has issued a Temporary Flight Restriction for the marked areas (see map) in the Hanalei and Wainiha area, particularly restricting all aircraft and UAS (drones). Please avoid the area to help ensure the safety our first responders during their ongoing emergency operations. The American Red Cross will be in the areas of Kōloa, Lāwa‘i, and the North Shore area to conduct additional damage and needs assessments throughout today. On Monday at around noon, 61 people sheltered at Hanalei Elementary School were evacuated by County bus to the Kilauea Gym. Red Cross had originally set up a shelter at the Church of the Pacific to receive the evacuees, but water was cut off there, so the evacuees were transported to Kilauea Gym instead. As of midnight last night, 13 people remained in the Kilauea Gym shelter. Disaster assessments have been hampered by severe weather and road closures on Kauaʻi, but with roads being cleared by the County, Red Cross volunteers will begin doing disaster assessment today. Yesterday, four Oʻahu Red Cross volunteers deployed to Kauaʻi to help with sheltering and mental health, health services (nurse), and government relations. 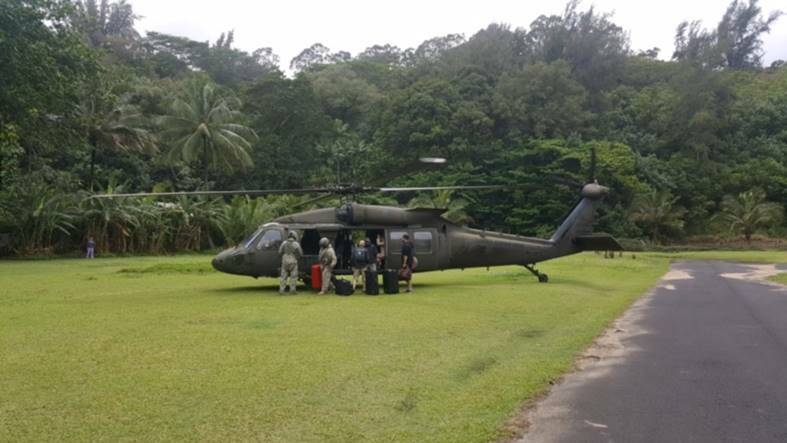 The deployed shelter manager provided much needed relief to the Kauaʻi volunteer who had served as shelter manager at the Hanalei shelter for two nights. Hawaiian Airlines has extended its waiver of reservation change fees for guests holding tickets for travel to and from Līhu‘e through April 18 due to heavy rain and flooding on Kaua‘i. Ticket was issued April 15 or earlier. Affected flight(s) is/are originally scheduled for travel between April 14-18, 2018. Changes must be made to the same class of service, origin and destination, for new flights no later than April 25, 2018. For changes made to new flights after April 25, 2018, the change fee will be waived but applicable difference in fare will be collected. Normal refund rules will apply. All changes must be made by calling Hawaiian Airlines’ reservations department at 1-800-367-5320. Guests are advised to check www.HawaiianAirlines.com for the latest updates on scheduled flights.